Marcello Perez de Lira hit terrorist running towards him at Gush Etzion Junction with one bullet, even as the area was crowded with people. IDF Southern Command held a ceremony today honoring soldiers who exhibited exemplary behavior during operational activity over the past year. 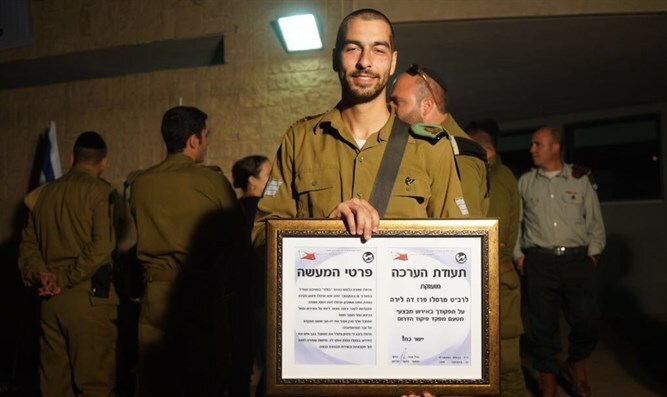 Marcello Perez de Lira, a combat soldier from the 50th Battalion of the Nahal Brigade, was chosen to receive a certificate of appreciation from the Commander of the Southern Command, Major General Eyal Zamir, for his behavior during operational activity in October. While guarding the Gush Etzion Junction under the Etzion Regional Brigade, Marcelo noticed a suspicious figure approaching him. He immediately reported the incident and proceeded with army procedure for detaining a suspicious person. After warning the suspect twice to stop, Marcello loaded his gun. The terrorist began to run toward him with an object in his hand, and Marcelo skillfully shot him with only one bullet that neutralized the terrorist without harming other people. The Gush Junction is a crowded intersection at all hours of the day, and Marcelo's accuracy in neutralizing the terrorist avoided harm to the many residents passing by during these hours. Marcelo's story begins in Brazil, where he was born. As a child, he grew up on his mother's stories in which she described the Land of Israel. As a young man, he dreamed of immigrating to Israel, enlisting and making his contribution, and when his mother died, he decided to fulfill his dream and serve as a combat soldier in the Nahal Brigade. Marcelo told Arutz Sheva, "I did my duty. I am sure that every other soldier in the Nahal Brigade and the IDF in general would have done the same thing. To protect civilians is the task of our army, and that is why I enlisted. "